Chris Cummiskey is the Chief Executive Officer of Cummiskey Strategic Solutions, LLC, a firm that specializes in cyber/IT, homeland security and management consulting. Mr. Cummiskey serves as a strategic advisor to companies and boards of directors on a wide range of topics ranging from government acquisition to business capture. Mr. Cummiskey has 24 years of government experience in senior positions at both the Federal and state levels. Mr. Cummiskey was elected to the Arizona State Legislature at the age of 26 and served in the House and Senate for more than a decade. During this time, he oversaw various municipal finance and state pension funds, including the Arizona State Retirement System and the Arizona Public Safety Retirement System. As a state senator, he held numerous leadership positions and was credited with developing technology solutions to improve government service delivery. After his time in the state legislature, Mr. Cummiskey served as the Chief Information Officer for the State of Arizona where he received the Distinguished Service to State Government award from the National Governor’s Association for his work in government innovation. He is credited with creating the state’s first cybersecurity plan and establishing the Arizona Cyber Information Security Office. Mr. Cummiskey is a nationally recognized leader in technology, innovation and cybersecurity. 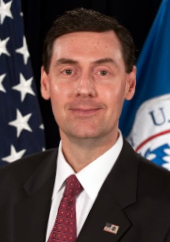 After serving at the state level, Mr. Cummiskey served in senior leadership at the US Department of Homeland Security (DHS) for six years, most recently in the number three position at the department as Under Secretary for Management. During his tenure as Under Secretary and Deputy Under Secretary, he had department-wide oversight and responsibility for budget/finance, cyber/IT, procurement/contracting, human capital, security and mission support. He also served as the department’s Chief Acquisition Officer overseeing $19 Billion in annual spending. While at DHS, Mr. Cummiskey co-led all the major cyber committees at the department including the Executive Steering Committee on the National Cybersecurity Protection System (Einstein), the Executive Steering Committee on Cyber Strategy, the Acquisition Review Board on government-wide Continuous Diagnostics and Mitigation (CDM) and the Executive Steering Committee on Cyber Hiring. Mr. Cummiskey serves as a Senior Fellow with the George Washington University – Center for Cyber and Homeland Security. He is also a Senior Fellow with the Center for Digital Government, providing cybersecurity expertise to state and local governments. Mr. Cummiskey serves on numerous boards as a senior advisor on homeland security, cyber and management issues including: The Homeland Security and Defense Business Council, the Government Technology Services Coalition, the Washington Homeland Security Roundtable, as a COO Senior Advisor to Government Executives (SAGE) with the Partnership for Public Service and as a cyber expert with the Washington Post.